Roger Federer for sure had a great time during his 1st Gillette Federer Tour match vs Thomaz Bellucci. Not only, he smiled, laughed, played a tweener while laughing, but also danced during the match . For sure, Roger Federer has some very passionate fans in Brazil and some of the banners that fans carried along with them during the match explains why Federer is the most loved Tennis player in the world. 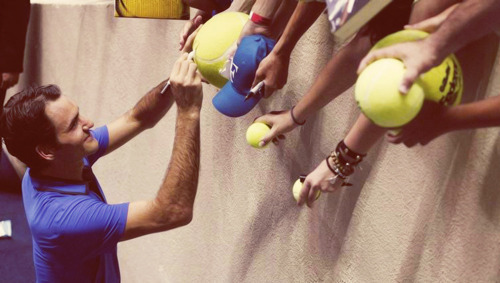 He he he, oh my God I do not know whether to laugh or envy them,listen to the guy who yelled ....I hope that all the kids got Federer's autograph,and also the old woman .